"Christine Motschall helped us sell an old town property in Fort Collins after the sale of this property stalled. We needed a motivated, responsive and committed broker to get our beautiful property in the hands of a new, appreciative owner. Christine's diligence helped us get our house under contract and sold almost immediately. We really enjoyed working with Christine and felt like she listened to our needs. Her character and caring attention made a great difference in the marketing and presentation of our property. We value her reputation and appreciation of both our and the buyers needs to help make this a successful business experience." "Christine was great to work with from beginning to end. She's professional, listens, and explained the whole process. I would absolutely recommend her to friends, family, and colleagues." 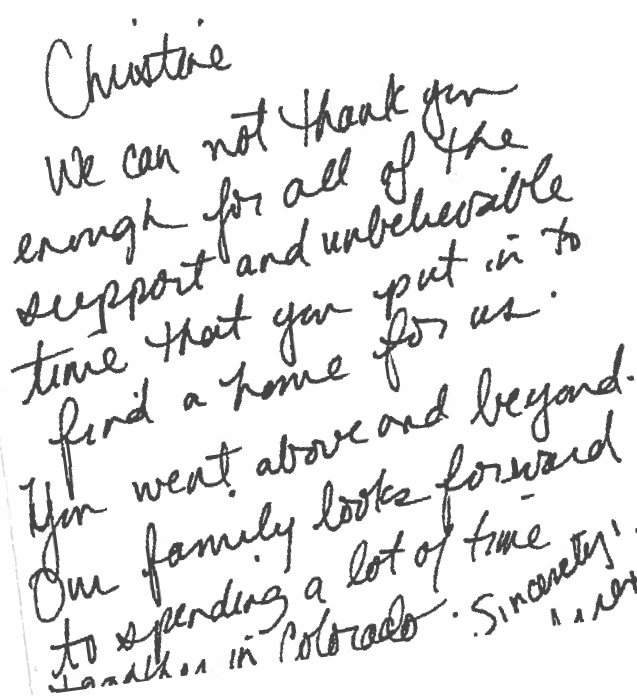 "Christine did an outstanding job in getting our house sold with a result that delighted us in Old Town Fort Collins." "Christine is everything we could of hoped for in a realtor. She took her time making sure that we understood every single step of the process. No question was too small, and she listened to us and our needs the entire time. She has the biggest heart, and working with her was like working with family. I wasn't the easiest client, we looked for a few months before we found something, and Christine drove all over Northern Colorado with us to help us find our new home. I texted her at all hours, with question after question, and she replied as quickly as she could in the most helpful way possible. She was so patient and helpful, we were truly blessed to have her helping us. I cannot rave enough about my experience! From start to finish, everything was handled in the best possible way that it could have been. As long as I am living in this area, I will never use anyone else. I will forever refer Christine and Joan to anyone even considering home buying as an option. If you want a realtor that is kind, hard working, up-front, honest, sincere, and knowledgeable, Christine Motschall is the realtor for you. Thank you Christine for everything!!!" "Within a few minutes of chatting with her, we knew we wanted her to be our broker"
"Christine Motschall took care of us from the start. She was very professional, patient and understanding of our needs. We felt very well taken care of and felt she went above and beyond her scope of responsibilities. I'd highly recommend Christine. She will take care of you throughout the entire process." "Christine Motschall was excellent to work with! Very professional and knowledgeable. She was very patient with me as I explored a lot of options and was extremely workable, even when she was out of town. I would always recommend Christine to anybody looking for a realtor!"